AUFSAE Brings Home Best Finish in Team History! 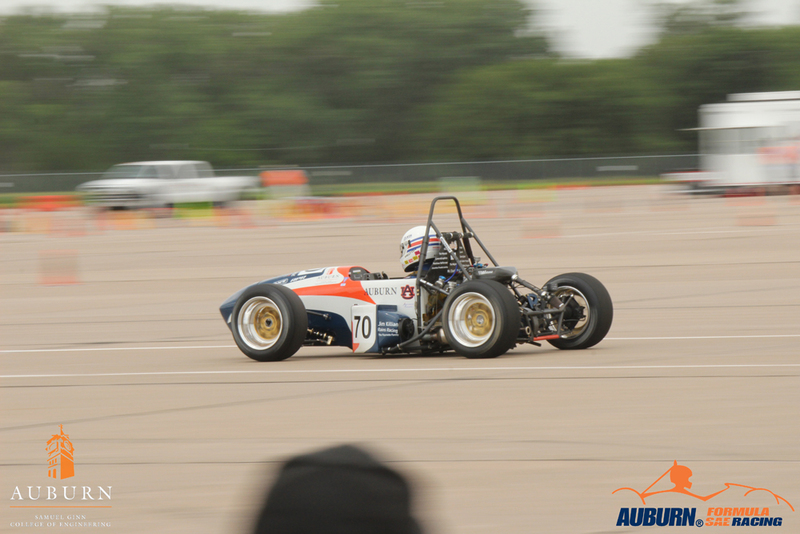 Auburn Formula SAE has returned home from Formula SAE Lincoln bearing a slightly heavier load than when the team departed a week ago today. 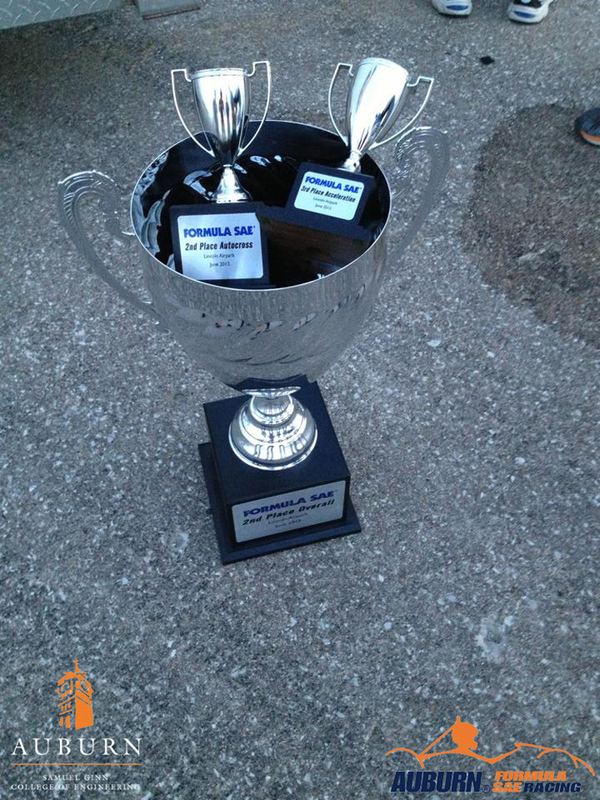 Three trophies, one for a second place finish in Autocross, another for a 3rd place finish in Acceleration, and the third; a massive trophy for Auburn’s first 2nd place overall finish! FSAE Lincoln began on Wednesday, June 19th with Technical Inspection. The team made it through tech with no issues to speak of, and then passed tilt first thing Thursday morning. When the car was first being started for the noise test on Thursday smoke began pouring out of the car’s battery, and the team feared for the worst. After a few hours of repairs the electronics team had the car up and running with a new battery and starter motor, and proceeded to pass noise and brake! Thursday also means Static events, and the team participated in the Cost, Presentation, and Design events. Friday saw the first on track action for AU-2013 in the Skid-pad event. Drivers Kurt Wagner, and C.J. Milstead drove AU-2013 to a 9th place finish in Skid-pad and a 3rd place finish in Accel, lead by event captain Chip Stallings. That afternoon the team ran in the Autocross event, Drivers Zach Woollen and Andrew Rains teamed up to bring home a 2nd place finish with Zach’s 52.100 lap time bested only by the 51.569 set by Missouri S&T. This result was truly astonishing especially after the team had to replace another battery and voltage regulator, as well as fix a leaking shift bottle in the staging area for the event. Saturday saw the arrival of some of our biggest supporters, Dr. Christopher Roberts, the Dean of the Samuel Ginn College of Engineering, and Jim Killian, Director of Communications and Marketing for the College. Saturday is the Endurance event, and after a morning of rain and intense wind the team was anxious to get on track that afternoon. Andrew Rains started the car and set a consistent pace. After ten laps he brought AU-2013 into the driver change area and handed the car over to Zach Woollen who went on to finish the event after nine more laps at an ever quicker pace. Although the team had to make some compromises to prevent the car from overheating in the scolding hot Nebraska sun, the fuel efficiency score benefitted from Andrew and Zach short shifting and not using full-throttle. An Endurance finish of 5th place and a finish of 8th in efficiency allowed AUFSAE to bring home a podium finish overall finishing in 2nd place, the highest finish in AUFSAE history!!! The entire team is extremely thankful to all of the individuals and companies that made this success possible! Auburn truly produces the best engineers in the world, and AUFSAE continues to prove that to the world by continuing to finish better in each competition! As always the team would like to thank Dr. Roberts, and the Samuel Ginn College of Engineering for the role they play in this team’s success. 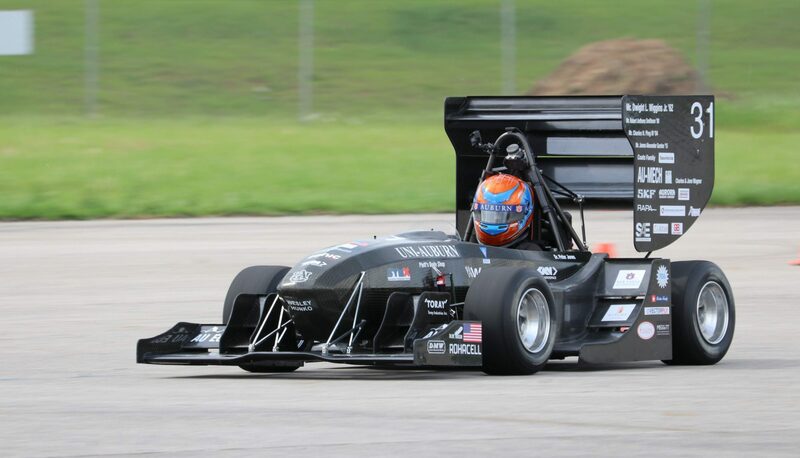 Formula SAE is the most intensive student project in the world, and Auburn is right up there fighting for overall wins with the best Engineering Universities in the world! We are greatly looking forward to continuing this momentum into the 2014 season as we target a top 10 finish at FSAE Michigan, and will most certainly be in the mix for a win yet again in Lincoln! Official event results can be found here.